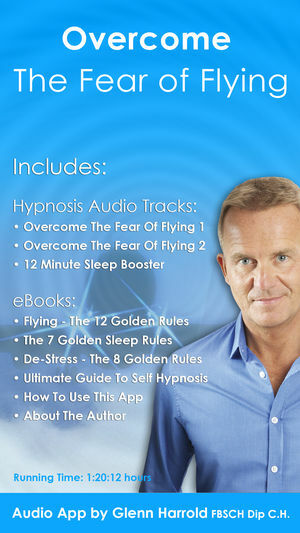 Overcome The Fear of Flying app by Glenn Harrold is a hypnosis relaxation app. The author has sold millions of CDs, MP3 downloads and Apps and he is one of the worlds top selling hypnotherapists. 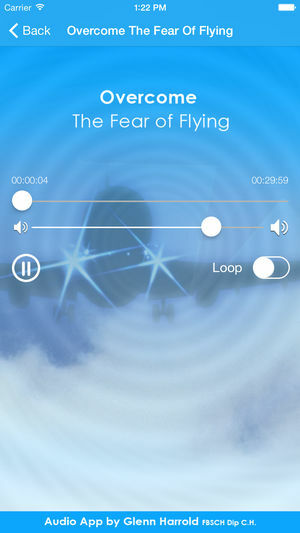 The hypnosis techniques behind this apps helped many people overcome their flying phobia in a deep way. The hypnotherapy session will guide you safely into a deep state of relaxation and give you wide range of tools to help you to practice your mind to get rid any fear and fly with full confidence. On the hypnotherapy sounds you will hear Glenn’s voice along with hypnotic echoed background affirmations panning from left to right, with delicate background sound effects recorded at certain frequencies and in specific keys to enhance the deep relaxation effect. After being guided into a deeply relaxed and receptive state you will effortlessly absorb the many post hypnotic suggestions which will make you feel completely in control of your thoughts and feelings when flight. This common fear is purely a state of mind and overcoming the fear of flying phobia is very important in this day and age of easy travel. Glenn Harrold has successfully helped thousands of people overcome their Phobia. The audio track has been created to help you to get rid of anxiety and to overcome your fearful perception of flying by using powerful desensitization techniques and post hypnotic methods. For maximum results you should listen on a daily basis leading up to the day of your next flight. You should start this ideally 2 weeks before your flight date. Glenn’s highly acclaimed hypnotherapy techniques guiding you into a completely relaxed state of mind & body. 60 b.p.m. background sound effects recorded in specific musical keys and frequencies to compliment the hypnotic suggestions and deepen the relaxation effect. Stereo-echoed affirmations which pan from ear to ear across the stereo range – a deeply relaxing and unique effect. Powerful subliminal suggestions embedded under the fade out music to maximise the overall effectiveness of the recordings.